Relax and be as you are on Norris Lake. Located in prestigious Lakeside Estates gated community, 'Wake Dreams' cabin has everything for your vacation. Let the kids wakeboard/water-ski all day while you relax on one of the four lake-view decks. The kids can cook s'mores on the campfire. End the long day soaking in your private hot-tub. Park your boat in the personal covered boat dock directly in front of your cabin. No boat? No worries! Nearby Norris Lake Watersports, Oasis Watersports, Sugar Hollow marina, Shanghai marina offer daily/weekly boat rentals. Enter the cabin Main Level (no steps required) to see oak floors, knotty pine walls & ceiling. The great room provides plenty of space to gather with friends and family. The main deck has a propane grill overlooking the lake (free propane). The fully equipped luxury kitchen is open to the large dining room with table. The loaded kitchen features granite counters, stainless steel appliances, dish washer, coffee maker, blender, toaster, serving trays, pots/pans, dishes, cutlery service for 30 people. Upper Levels have bedrooms 2, 3, & 4. Lower Level has another TV room, spare refrigerator. convenient washer & dryer, bedrooms 5 & 6, and a deck overlooking the lake making a fantastic reading room. Bottom Level (walk out level) has the hot tub deck and entrance to bedrooms 7 & 8. The Sun Deck is built right on the shoreline providing an ideal location to watch over the little swimmers. Free long distance calls, free internet, free DirecTV, free propane, free boat ramp, free trailer parking, free community pool access. This cabin is located right around the corner from the famous "Jumping Bridge" where all the boaters love to simply hang out, swim in the clean water, and get the nerve to take a plunge off the bridge. If you get tired of grilling, make the 10-minute drive into charming downtown LaFollette and grab a bite at one of the restaurants. John Bertke lives in Dayton Ohio and enjoys visiting Norris with his friends and family. He enjoys fishing and smoking cigars. He took over management of this property in early 2014. Cabin is built right on the shoreline of Norris Lake near the famous 'Jumping Bridge'. Park your boats in private covered dock right in front of the cabin. 1 on main floor. 1 on lower level. place settings, pots/pans, silverware, small appliances provided. A 'kitchen inventory' list is provided for your convenience. 2 in living rooms and 3 in bedrooms. All high def DirecTV. 3 cabin decks overlook lake. 1 sundeck sits on the lake. multiple course nearby. Contact owner for details. no steps from parking area to main floor. Note: no doors have been widened. Please contact us for details. pool located a short walk down street then up a steep hill. Exclusive >>>> we change the hot tub water prior to your arrival. We stayed at Wake Dreams this past summer and returned again over the holidays for a family getaway. The lowest level has been completely renovated with all new drywall, hardwood floors, bathroom, and looks amazing. There is no musty smell or odor and we were very impressed. This house has an amazing location in the summer since it is at the front of the neighborhood in a no wake zone very close to the bridge. In the winter it has deep water and concrete steps with an amazing view. The fire pit was great and they even delivered firewood to us! There were more than enough dishes, pots/pans, and silverware for our group. We'll be definitely back this summer! Thank you for returning to Norris Lake and Wake Dreams cabin. 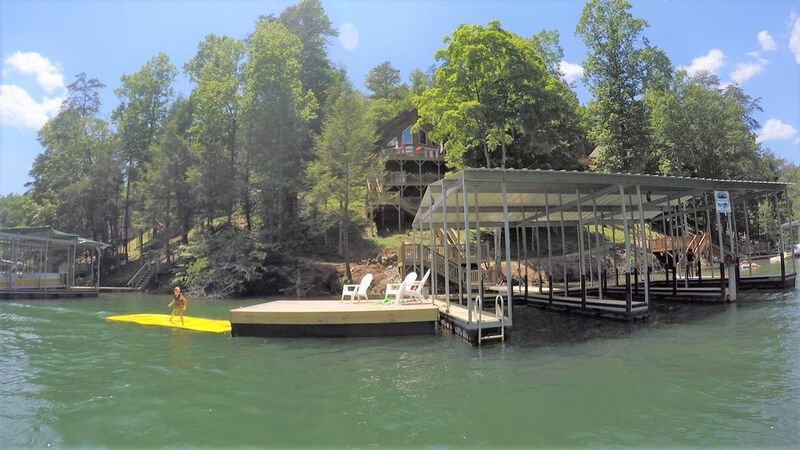 The new owners have poured great effort into this beautiful cabin including the addition of the fire pit and clean access to the year-round floating dock. As a repeat Norris traveler I see you noticed the strategic combination of isolation for nice, deep swimming yet close enough to the wildly popular ‘Jump’n Bridge’, open ski water, an numerous marinas 😉� And yes we finally found and mitigated the nuisance walk out level musty source. Along with all new walls we eliminated the carpeting and replaced with the popular luxury vinyl planking. Hope to see you all again. 11 Golfers stayed here for a 3 day tournament. We enjoyed our stay but there were some issues. The walkout level was a waste...musty smell and outside entrance only, very separate from the rest of the group. Parking was also an issue, very little room for 4-5 cars. If your planning based on beds, don't count on the walk out level, everything else is fine. Also should be aware that the area around the cabin has no service, like none....so you need to have a map, and use the wifi at the house. If you book after Labor Day, lots of things close up, stores marinas etc.... go before the holiday. Norris Lake does have much to offer including the nearby golf courses. These courses remain open **all year** as well as the large restaurant, many grocery stores, fast food, drug stores, liquor store, and hospital 7 minutes from the cabin. Shopping malls in Clinton and Oak Ridge provide great Christmas shopping opportunities. Catch the latest movies at the theatres. Some of the marinas start winding down after late September. The 5 minute away Sugar Hollow remains open weekends very late in the season. As you had indicated much of the lake is underserved by the cell phone industry but this is not exclusive to Wake Dreams or its location. Cell service is a challenge all over the area due to the mountainous terrain. As a result we provide free land line long distance, free wifi, and free maps/directions to the cabin. As anyone who has visited expensive water front property, parking is a premium. Wake Dreams has an advantage over the others in the neighborhood by having plenty of parking for 6-7 vehicles if parked orderly. The musty smell has been mitigated and the entire walkout level has been renovated. We really loved this house and the part of the Lake the house is on, right down from the jumping bridge and Sugar Hollow Marina. The boat dock was covered and very nice. The master bedroom was awesome and the house is beautiful. No complaints. Just some minor things that need done like caulk around the kitchen sink, update some pots and pans and dishes, little things like that. We will likely be coming back again next year. Overall, the house was fine. I felt a little misled about two of the bedrooms. They could only be accessed from the outside and you had to walk through one of the bedrooms to get to the other. With most of us having younger kids, those two bedrooms made a big difference. They weren’t doable for the kids because we couldn’t hear them from the top level if we put them to bed before us. Other than that, it had a floating dock which we enjoyed and a nice fire pit. The house was clean and the hot tub was a big hit. We would definitely come back to Norris Lake! As you had indicated at booking, you had never been to Norris Lake. It is always helpful to become familiar with the new vacation location. As for the “walkout” level separate entrance we list this in the description section and the photo caption. Many cabins located on Norris Lake have this feature. Many travelers enjoy this isolated feature – some do not. Beautiful home! Bottom level was extreme musty and unusable but the rest of the house was great! Wake Dreams was a beautiful house. It fit our family of 15, however the bottom level was extremely musty which meant we could not use it and some families had to share rooms. There was a big dehumidifier in one of the rooms but the smell was so overwhelming that we could not put people down there. The dock worked out perfect for our 2 jet skis and boat. Our family enjoyed swimming every day off of the swimming platform as well. Overall, we enjoyed the house! I am glad that you enjoyed your stay. For the 2019 season the new owners have done many nice upgrades to this beautiful cabin. After the busy rental season ended we removed the entire flooring to discover an old water leak. As a result the leak was mitigated and the entire level was completely renovated with all new flooring, subfloor, and drywall. Wake Dreams was a really nice house, perfect for our family reunion. We went early spring and it was still cold but the hot tub still worked so that was really nice! House is really open and there is a lot of space for everything you would need. Only dislikes and problems were the power went out for 1-2 hours (not that big of a deal), the downstairs bedrooms were musty. The owner did try his best to fix with dehumidifiers and it's wasn't horrible. One of the pillows on the beds were stained (didn't look clean but probably was clean). And lastly, there is no cell service at the house, but there is free WiFi. All and all, the issues we're very minor and we had a great time with the family. Thank you for letting us use your wonderful home! Prices exclude holidays. Cleaning fee includes bed linens and bath towels. Must be a minimum 28 years of age to rent this beautiful and well maintained cabin.